The Visible Legacy Map Widget shows you a great deal of information about the a selected topic and has simple ways filter it. You can then easily navigate from project to project through the connections of people, organizations and documents, discerning relationships and discovering new insights. The widget is intended to be embedded in an external web page to offer visual context. When you discover a topic of interest, you can easily open a full page in Navigator for additional information and features. This page describes some of the features of Widgets. The Widget visual elements interact. The Collaboration Map and Timelines are connected. Roll over these elements and click the nodes to navigate to new topics within the same widget. Or follow links to related web pages. 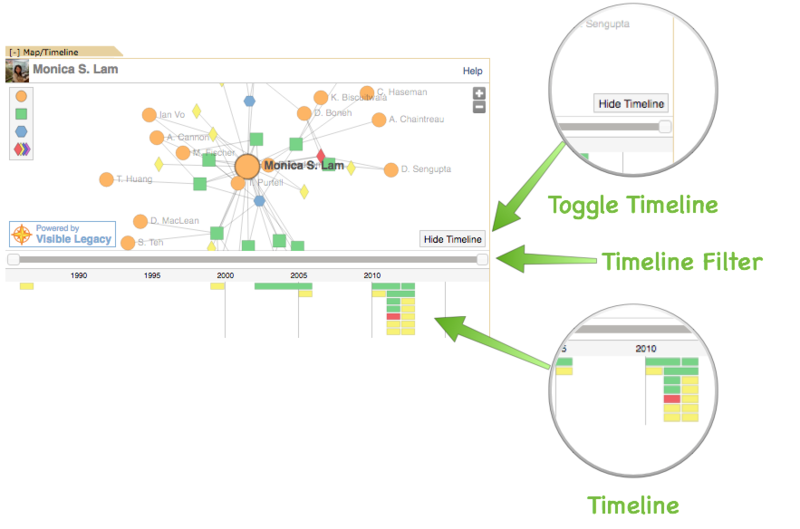 The top of the widget offers the Topic name followed by the Collaboration Map graph and various timelines. Below is the map are timeline and buttons to filter the view. The Collaboration Map shows the Topic as the central node surrounded by projects, people and organizations who are project participants. Additional context is provided by the various documents such as papers, patents, inventions. Use the + / - controls to zoom in to see more detail or zoom out to see more relationships. You can drag nodes around to orient the connections, or drag the white background to slide the whole map. The Node color and shape represent different topics as shown above. The lines represent a connection. People and Organizations participate in Projects. People author Papers and Invention Disclosure documents and then participate in the Patent. News Stories are written about People and Organizations. People have a relationship with an Organization such as being a Lab Director or a Department Member. Sometimes more distant Organization to People relationships are shown with a dotted line. By clicking a node you will open an information box or "Callout Box" (example shown above) containing more information about the node topic. Each call-out has related links depending on the kind of node, for example researcher profiles and lab sites, project description sites, and related TechFinder pages. You will also find a Topic Summary with a paragraph that can be expanded by using the small [+] at the end. You may find project participant names. Some topics include Keywords which will open a new window in TechFinder using this keyword as the search term. The data in the Collaboration Map is presented on a combined timeline. Use the Show Timeline button and Hide Timeline button to show and hide this timeline. The combined timeline shows projects and documents related to the central node topic. Rolling over a timeline element will highlight the node on the map and vice versa. The two-handled grey slider is a Timeline Filter which sets the start and end date of a date-range showing nodes within a time of interest. The Timeline Filter fades nodes outside the set time period in the map, timeline, and Tabs. Use the Filter By Type buttons to improve clarity of topics of interest by fading and almost hiding selected nodes. Buttons may be used singly or together. The yellow compass button will open the corresponding topic in the Visible Legacy Navigator in a new window. The Navigator presents more nodes and detail in the map and offers additional features. Visit the Navigator Help page. The widget is designed to be added to your research page by inserting a line of code. The topic of the widget is set by the topic ID. In this case, the topic ID is FMI:4489. You can find the topic ID in the URL of the page as shown in Navigator. The Advanced Search Box will also be available as an embeddable Widget. The Advanced Search Box widget returns a list of search results within the box on the page. If the user clicks a result list topic, the Advanced Search Box Widget opens the topic as a Map widget in the same frame. We are also working on a Search API; please contact us for details. Use of embeded widgets is governed by these Terms.